PepsiCo’s Quaker brand was looking to stimulate orders from their campus retailer partner ARAMARK. 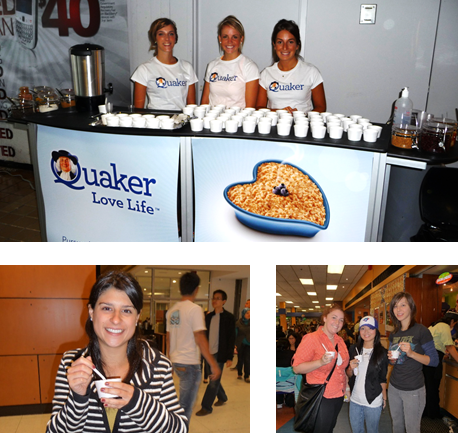 As ARAMARK’s sampling agency of record, we helped assemble a retail activation program that benefited Quaker, ARAMARK and students on-campus. We worked with ARAMARK to secure an auto-shipment of Quaker Instant Oat cases to participating university and college locations. We augmented this auto-shipment with a live sampling program and POS signage designed to reignite students’ appetite for morning oatmeal. Over 3 months, single serve packet volume grew by an average of 102% VYA and case volume yielded a 95% increase in volume over the same period.